Die Bootstrap Installer staat er niet tussen? 2. Dus maar overgestapt naar http://zarino.co.uk/post/ds214se-under-the-hood geprobeerd, maar ik heb geen idee wat ik aan het doen ben, dan alleen kopieren/plakken van hetgeen er staat. Press Escape, then type :wq to close and save your changes. Then, finally, type source /etc/profile to reload your shell settings. Na een paar uur lezen, ben ik helaas nog niet verder gekomen. Hulp is zeer dankbaar. 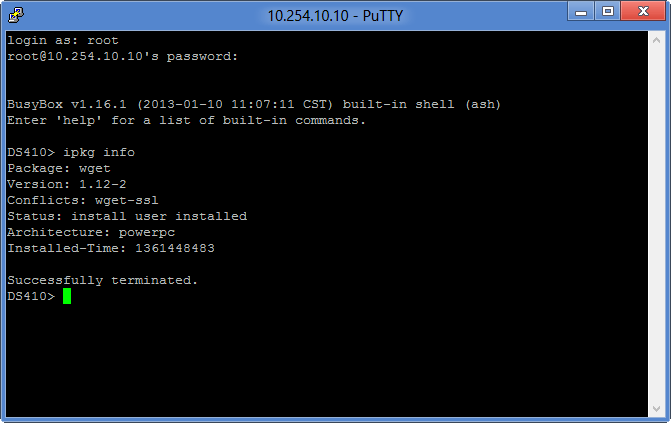 I noticed that if I exit the terminal, then log back into it with ssh its as though I haven’t install ipkg. It cannot see ipkg, or run any commands. I can however see that the rc.optware folder exists from my installation (and the second copy of the folder from when I tried to reinstall). This is what I have discovered for those who report that ipkg seems to disappear: While ssh’d into your disk station you must type source /etc/profile to reload your shell settings. Only then can you use ipkg and its commands. Does anyone know why this is true? I’ve got the same problems with a DS411+II. See my comments from above. I’ve got ipkg working on my DS209 at home, but I can’t seem to get it working on my DS212+ at the workplace. It says that there was an error installing the BootStrap Installer package in DSM, but then it says it’s installed and running when I reboot. 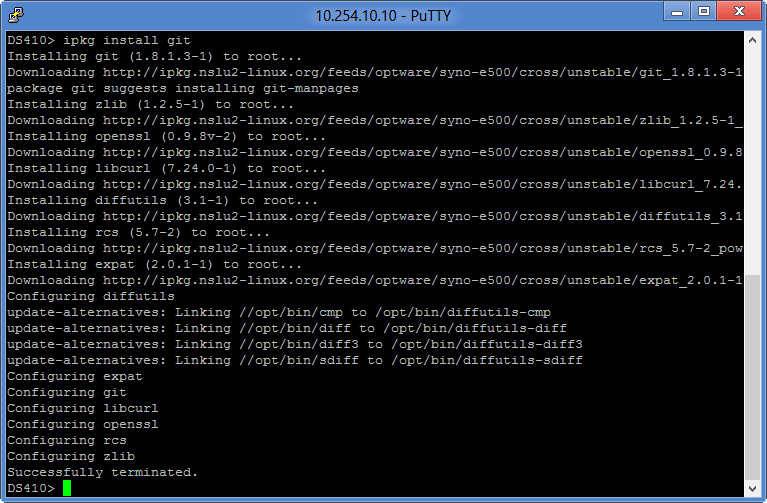 SSHing into the DS and trying to install something via ipkg simply returns the error “ipkg: command not found”. I’ve been having similar issues man. I got the ipkg (Bootstrap Installer) to install just fine on my old DS411 with no errors, but I’ve never been able to get it to install properly on either my DS1812+ or either of my two DS713+’s, I get the same exact error you’ve been getting! In the past I’ve occasionally found that some packages seem to raise compatability issues with other packages so I even tried completely wiping out all my data as well as the DSM on one of my DS713+’s just so that I could see if I could get the Bootstrap Installer to install properly on a fresh DSM install to rule out any possible software conflicts with other packages and even then I can’t get it to install properly! 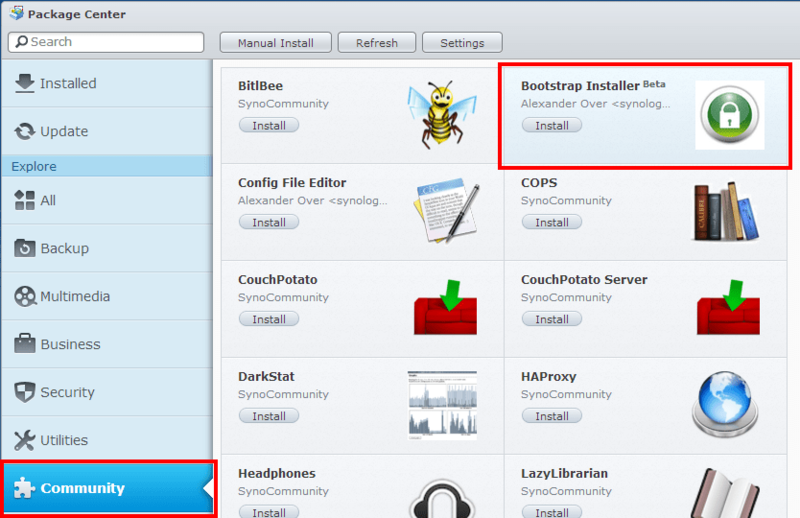 So if anyone on here happens to have any other ideas we could try to get the Bootstrap Installer to work I’m all ears!!! Tried it just now on my DS-411. Same result: package source added; no trace of Bootstrap Installer. Tried also the bootstrap script and it doesn’t work. Asks me to reboot and restart the script, but there is no ipkg installed. Hi Rob. Do you know about APC for linux? Alternative Php Cache. It could be installed using ipkg but i am not sure if it would help with speeding up the web interface of the dsm or websites which are hosted on the synology. Any comment? Thanks for the tutorial!!! I’ve added the Repo to my DS713+ & my DS1812+ and though the repo added just fine when I look through the “Community” tab I can’t find the Bootstrap Installer, I haven’t tried this yet on my DS411 so I’ll try that tonight but I’m wondering if I’m just missing something? Also I can’t seem to find your Spotweb tutorial on your blog here, has it been posted yet? If so could you post a link to it? You have some very informative info on your blog so I’m glad I stumbled onto it! Just a small comment, on http://packages.quadrat4.de/ the guid tells you to look in the “Other Sources” tab. In DSM 4.2 it is called “Community”. Do you have any ideas on how I could get some kind of MP3 ReplayGain scanning working on a Synology DS? Have you come across any packages for this? Since you are good with synology and raspberry i got a quick question for you. Would it be possible to install the Synology DSM on a Pi? Nice. What would be some nice options to install on a syno through ipkg that i can’t find on any package repo? Tonight I’ll write a post on how to install Spotweb (https://github.com/spotweb/spotweb) on a Syno DS. In this guide you’ll need to use ipkg. A tutorial on spotweb would be great! I am having troubles though to install ipkg installer. It works, but when I ssh into synology ipkg update and upgrade does not work, nor does he find any package I try to install. Does this still work on DSM 4.2?